Strip, Push, Connect – The Fastest Way To Make A Connection. 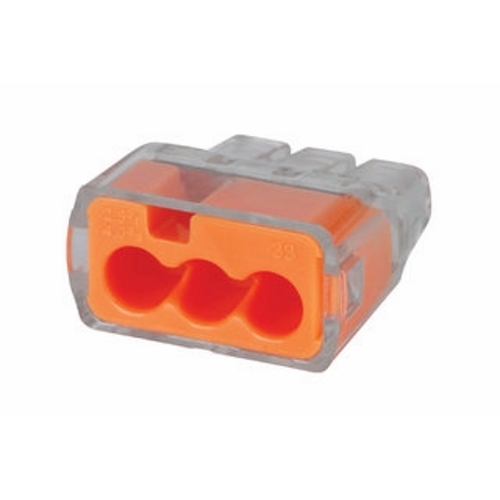 The In-Sure® Push-In Wire Connector is perfect for residential, light commercial, lighting retrofit, and pre-fab wiring systems, or any other branch circuit wiring application where a traditional twist-on wire connector would be used. Simply push the wire in – the low insertion force makes it easy. The color-coded shell allows for quick identification of port configuration while the clear polycarbonate housing allows for visual verification of every connection. The ergonomic design is easier to grip which means more comfortable push-in connections. The compact size makes for easy installations in even the tightest spots or shallow boxes, and the tough, flame-retardant shell stands up to the harshest environments. UL Listed, CSA Certified, and rated to 600V – the In-Sure® saves time and improves productivity while perfecting connections.